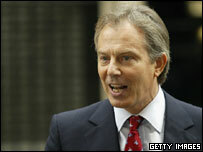 Tony Blair is trying to push through a raft of new legislation ahead of Monday's dissolution of Parliament. The Gambling Bill will survive, but ministers now say there should be only one super-casino instead of eight. However, plans for identity cards will be dropped, with Labour vowing to bring the proposals back if they secure a third term after the 5 May elections. Tories rejected Labour claims they had tried to "kill the bill" while the Lib Dems welcomed the decision to drop it. Home Secretary Charles Clarke blamed splits within the Conservative Party for the abandoning of the ID cards bill. However, a Tory spokesman has said it would be "quite wrong" to blame them for any failure to pass law before an election. "It is the government that decides the date of the election and the government who decided to pack the Queen's Speech with too much legislation," the spokesman said. He added the ID cards scheme was not due to come into force for 10 years so it was unwise and unnecessary to rush through a bill now. The Lib Dems have long opposed ID cards on civil liberties grounds. Mr Clarke said: "Labour's manifesto will confirm that the reintroduction of identity cards legislation will be an early priority after the election." The ID scheme would cost an estimated £3bn and see each UK citizen issued with a "biometric" card bearing fingerprints and other personal details which would also be stored on a new database. Opponents say the plans will infringe citizens' privacy but ministers insist they will help tackle illegal immigration, organised crime and terrorist groups. Mr Clarke said the Lib Dems had failed face up to "resolving the tension between individual liberty and community security". Meanwhile, Culture Secretary Tessa Jowell struck a deal with the Tories to save the Gambling Bill, by agreeing to scale down plans for eight super casinos to just one. Tory culture spokesman John Whittingdale said the government had accepted his party's proposal for one "prototype" super-casino and on that basis they were prepared to allow it to pass into law. Lib Dem Don Foster said: "We welcome this deal, which crucially allows for the rapid introduction of a tougher regulator whose remit will include internet gambling."